Punto de Vista | San Juan, Puerto Rico | dreaming of the next bite. On our second day of honeymooning in San Juan, we decided to walk from Old San Juan to the beach, which turned out to be quite a journey. Midway there, we stopped to rest along the road under some palm trees. We saw a couple approaching us, wearing bathing suits, so as they got closer, we inquired how much farther to the beach. They told us we were close and asked where we were from. Turns out the guy was from Wisconsin and his wife was from Youngstown, Ohio! They had retired five years ago, and now live six months of the year in Puerto Rico; the other six months are spent touring the states in an RV. They went on to tell us their favorite restaurants, one of them having “the best mofongo in San Juan.” At this point, we still didn’t know what mofongo was, but they explained it, and that evening we were heading to the recommended spot: Punto De Vista. 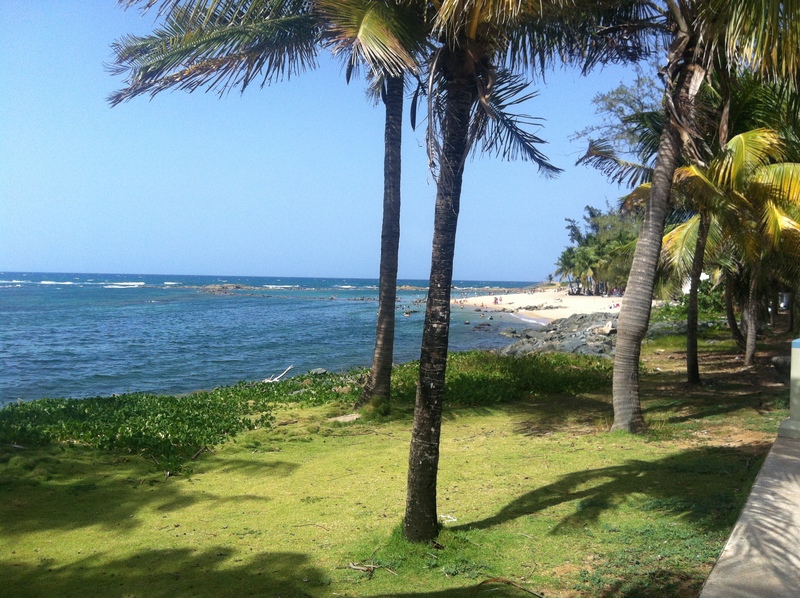 The picture above has nothing to do with Punto de Vista, consider it a gratuitous honeymoon photo….it is a view to the beach where we walked that day. I couldn’t help myself, such a beautiful place. Punto de Vista was located on the south side of the island of Old San Juan, directly across the street from where the cruise ships dock, so a very touristy area. However, since the mofongo had received such a glowing review from the American transplants we met, and because of the 4.5 out of 5 star rating on Yelp, we decided it was worth a visit. The restaurant itself could best be described as “local dive, with an attempt at beachy.” It was a small dining room, with mismatched and dated furniture, a funky bar, and bright paint colors and murals on the walls. 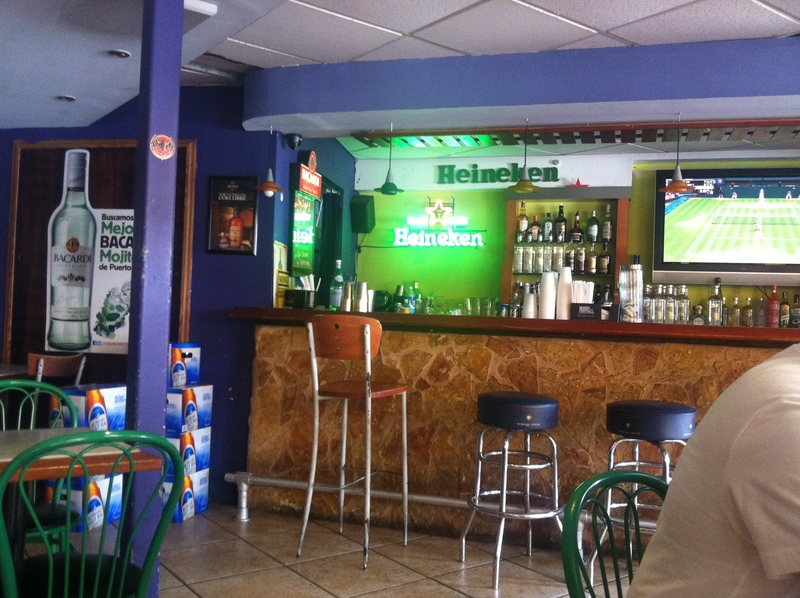 Definitely not the vibe we were expecting for the ‘best mofongo in Puerto Rico,’ but as I’ve learned, you can’t always judge a book by its cover. 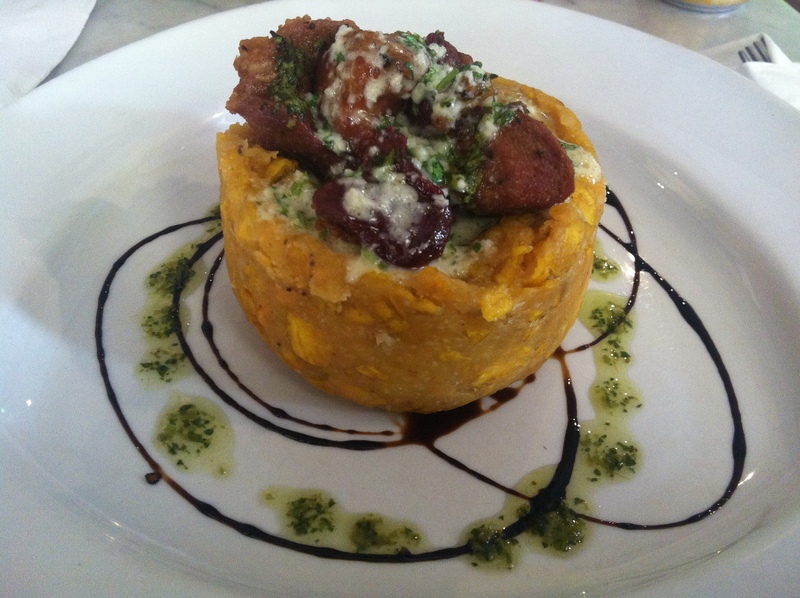 Mofongo is a signature dish of Puerto Rico. 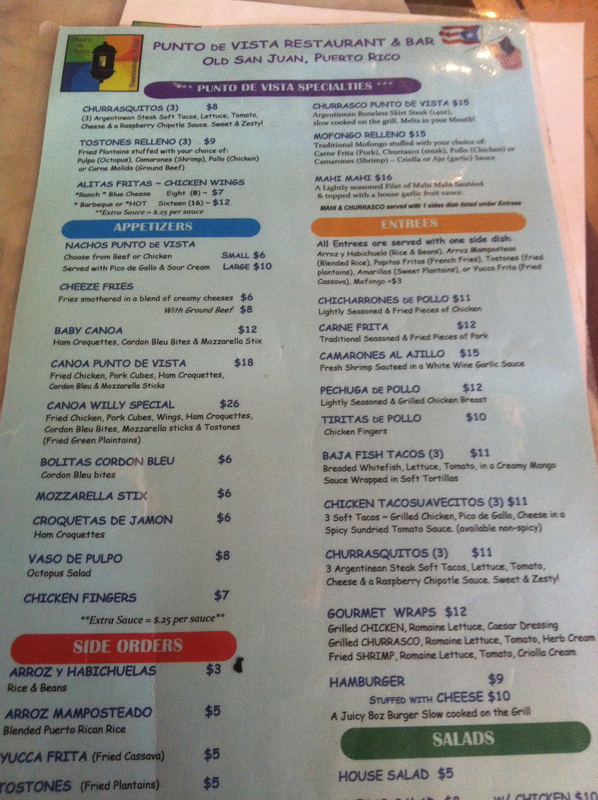 At Punto de Vista, you have the option of chicken, steak, pork, or shrimp with it, and also a choice between sauces: creole or garlic. I opted for the pork and the garlic. As the Americans had described to us, mofongo is basically a mashed plantain concoction that ends up having a consistency similar to mashed potatoes. After some quick research, it appears the plantains are traditionally mashed with broth, garlic, olive oil, and sometimes bacon for flavor. I can’t say enough about this dish. Being a plantain lover in general, this was heavenly. The garlic buttery sauce infiltrated the crevices of the plantain mixture and created a sinful result of savory and slightly sweet. The balsamic reduction added another dimension that made this mofongo really soar. The pork was definitely fried, it had a somewhat tough consistency which is probably my only issue with the dish, but even this problem was resolved with a brief marination in the garlic sauce. The flavors were absolutely outstanding. I wish we had found time to make it back so we could have tried the dish with the shrimp instead. Next trip! 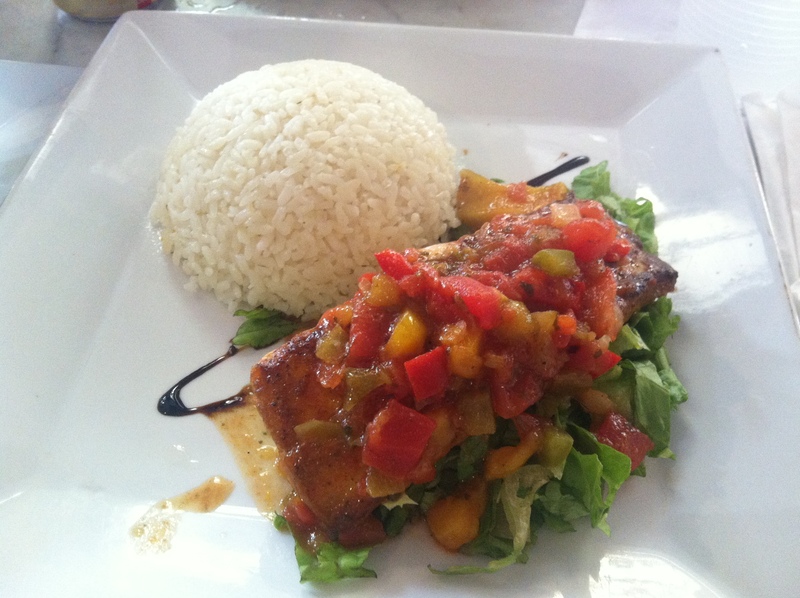 Dave ordered the grilled mahi mahi, which ended up being a so-so dish in comparison to the mofongo. Luckily the portion size on the mofongo was so huge that I was able to share with him. Again, this dish was well plated, and looked every bit the quality of the mofongo dish, but unfortunately the seasoning of the mahi mahi was a bit light. It was sauteed in the house made “creolla sauce” and had a lovely salsa-like topping, but overall it just couldn’t compete with the strong flavor profiles of the mofongo. 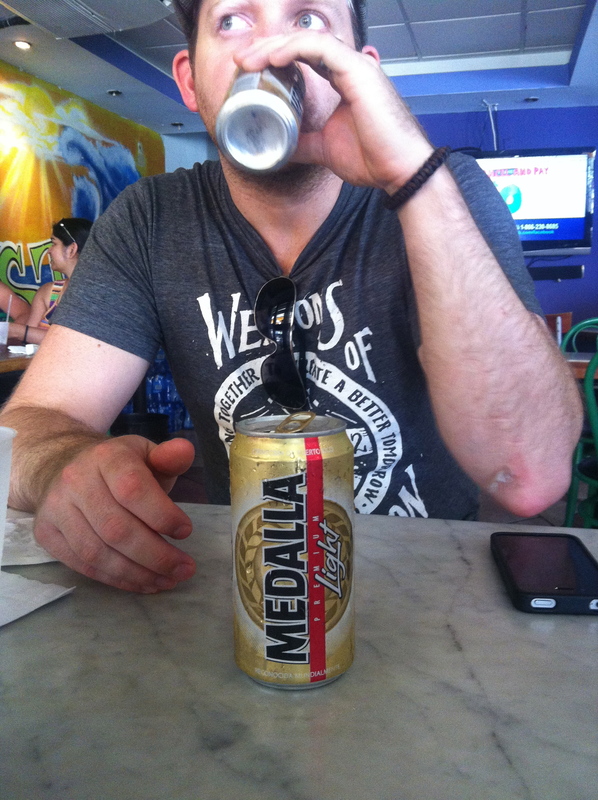 We had to order a Medalla Light, the official beer of Puerto Rico. Seriuosly, this beer sponsored pretty much everything on the island. It was everywhere. In terms of taste, it was basically similar to a Bud Light, if you ask me; nothing too special. But at $1.50, you can’t go wrong! Again: note the lack of a glass….did I mention this place was a total dive?! We did go on to try the mofongo at other restaurants, and this was by far the stand-out. We highly recommend a visit. 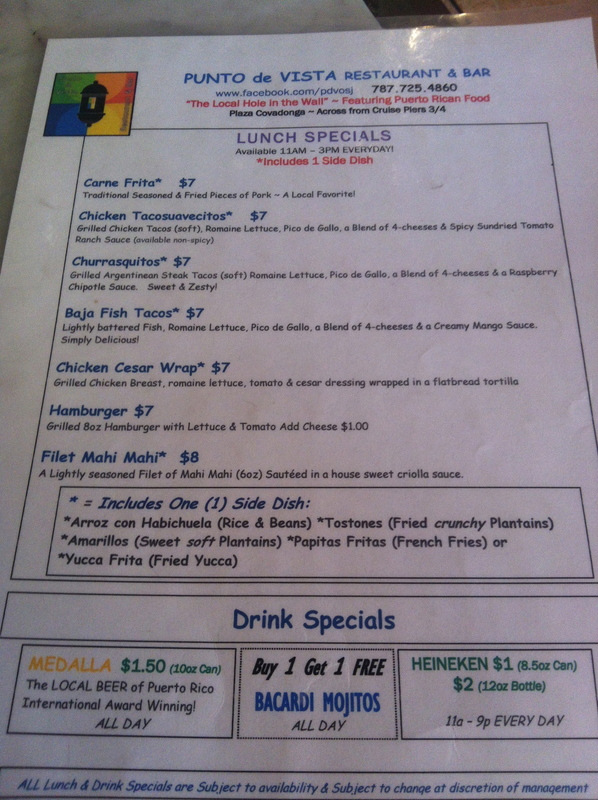 Side note, does anywhere in Northeast Ohio serve mofongo? Please message me if you’ve come across it! 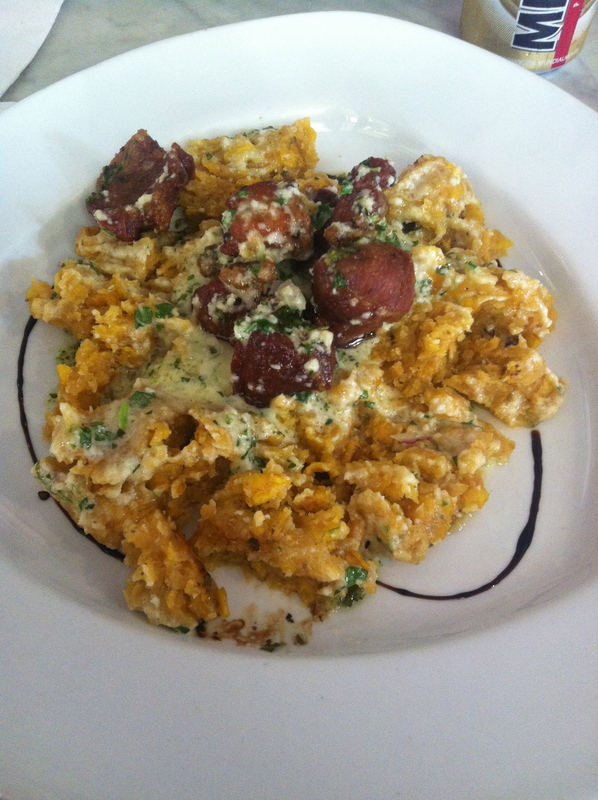 This entry was posted in San Juan, Puerto Rico and tagged Medalla Light, mofongo, Puerto Rican food by Yvette (@foodiedreamer). Bookmark the permalink.